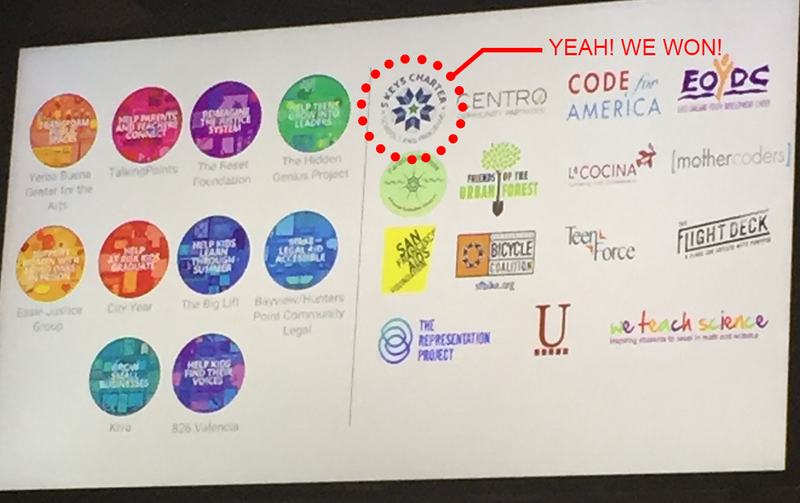 I can see that turning buses into other stuff is getting popular because on September 19th it was announced that we were one of 25 out of 800 applicants to win a Google Impact Challenge Grant. In addition, after two amazing community engagement workshops, 6 site visits and many interviews and surveys we have completed our concept design for the School on Wheels. We made a video you can watch and the rendering below. The Rauschenberg Foundation also released their new call for proposals for next year’s Artists as Activist and a video of me speaking about our project that helps set the stage for the kind of proposals they are looking for. You can check it out here with a zippy acoustic soundtrack. 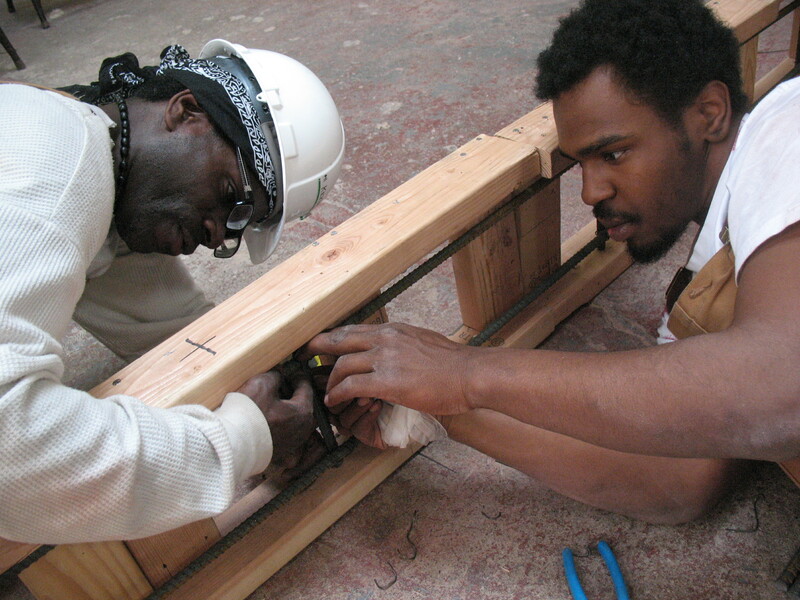 If you are an artist working on issues of mass incarceration, make sure to apply! As for our next steps, construction will begin soon and we are looking for space and electrical/mechanical engineers to help us out. If you know resources for either please send it my way. 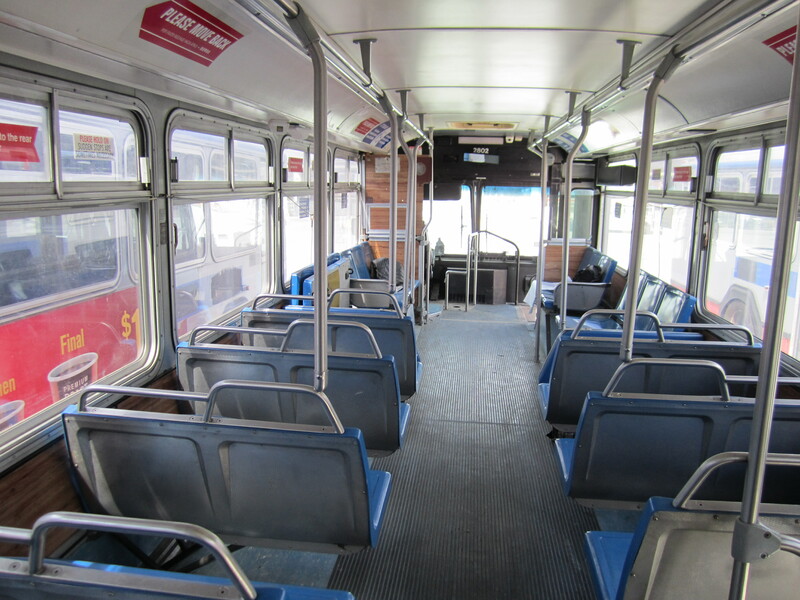 Starting January, we will also begin working with incarcerated women to design the next bus which will be a shelter for women released in the middle of the night. Often there are pimps waiting for them as they come out and they have nowhere to go. This vehicle will have social service representatives available to them, a shower, warm bed, and clothes. My hope is we can drive them somewhere safe too. We will also continue to reach out to other mobile service providers who can join us in creating the Pop up Resource Village. My hope is the next update will be photos of our first bus under construction and the women at work designing a mobile space for re-entry! If you told me that I would be able to launch my practice designing architecture for a videogame and then told me that it would take 5 years I wouldn’t have ever believed you. 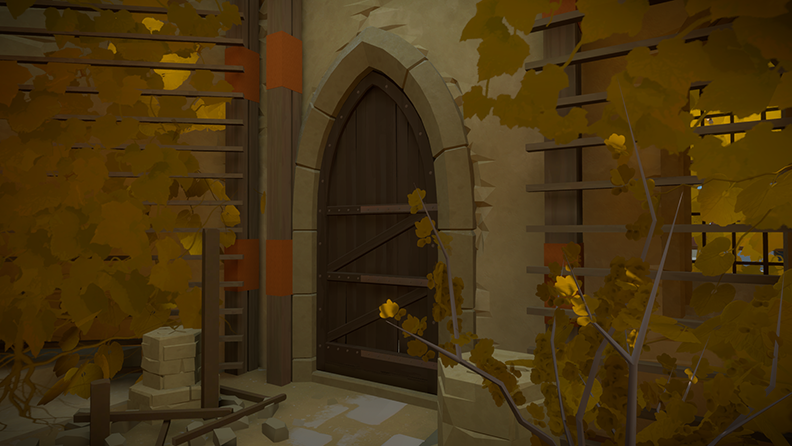 It still seems crazy to me that this past September marks the 5th year I have been working on The Witness. For those of you unfamiliar with the premise, it is a game that takes you to an unknown island where you learn a graphic language to solve puzzles and open secret doors to other spaces and realms. It is by far the longest I have worked on a single project, which really should not be a surprise given that it is an entire world. That said is was still an exciting day for me when the development company Thekla issued the release trailer stating that it would finally be coming out January 26th 2016. In preparation for the big day I wrote an article that was recently published in Gamasutra Magazine. 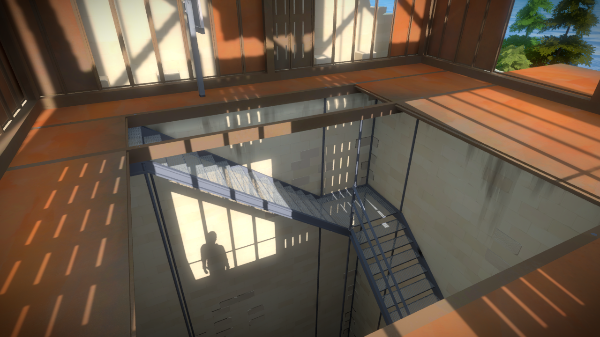 It was intended to hi-lite the role of architecture in this game and to help game developers understand how powerful architecture can be in helping them create environments that support gameplay. While I would not do a game that was violent or misogynistic, I whole-heartedly support the improved development of architecture in all games as my hope is that it will increase the visual literacy of our population and improve our real world environments. In addition to writing about the game I have been trying to use my status as one of a very very very small group of black people( never mind women) working in the industry by doing a workshop with my colleagues and artists from The Witness, Orsi Spanyol and Luis Antonio. 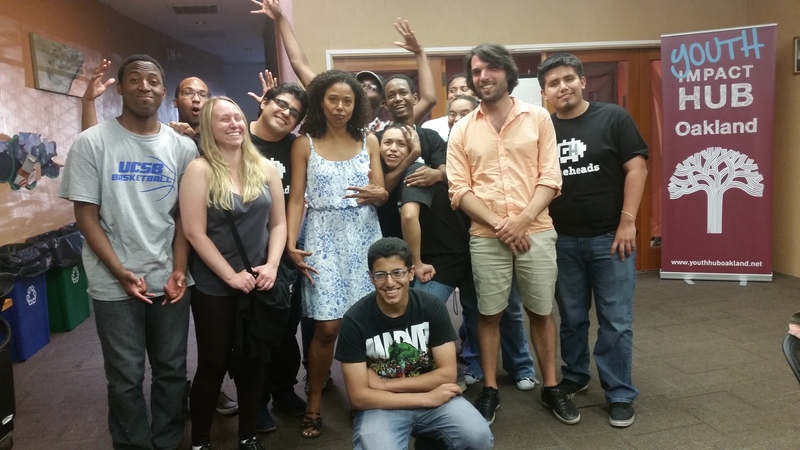 The workshop was with a great organization called Gameheads. 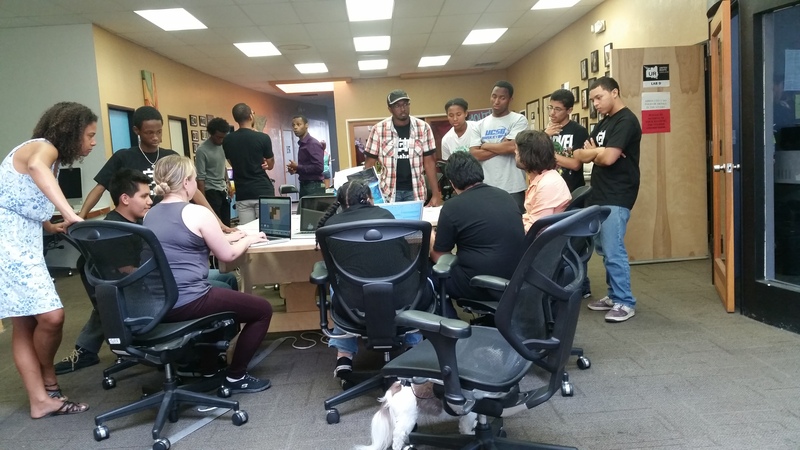 They are focused on developing games with youth including prototype development, programming, art and production. We spoke with them about our process but we also played their games and talked about how they could develop them further. The students were smart, creative, and sophisticated in so many ways. They were inspiring to me and wearing my new Gameheads t-shirt I left feeling really good about working in this industry. Who knows if I will continue doing this kind of work but the truth is I would really like to. 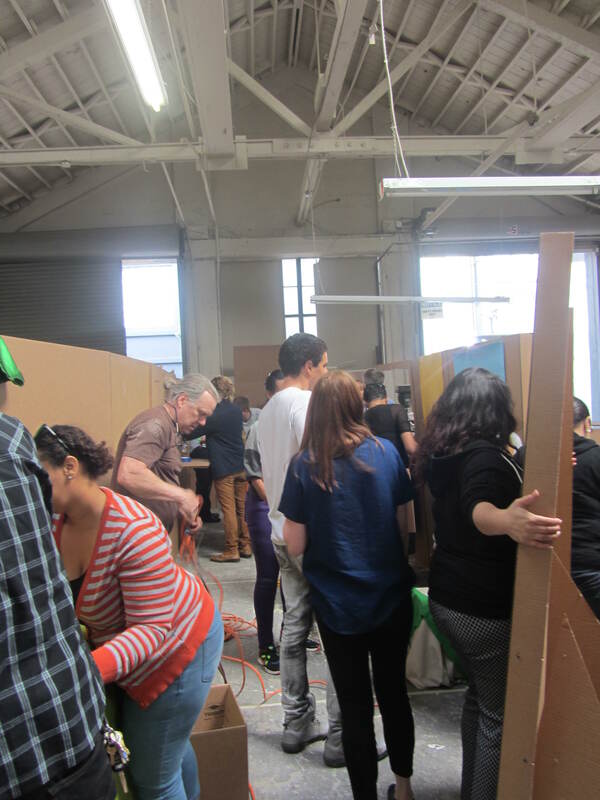 Every once in a while I have an idea that comes off better than expected and last Thursday’s Pop-up Resource Village Workshop we did with the teachers and students of 5 Keys Charter School and Asian Neighborhood Design( AND) was definitely one of them. I can’t remember a time I had more fun at work. For this workshop, I thought we might sidestep the old qualitative interviewing and observing and get all the users to build a full size model of the project. In this case, a bus turned into a classroom. 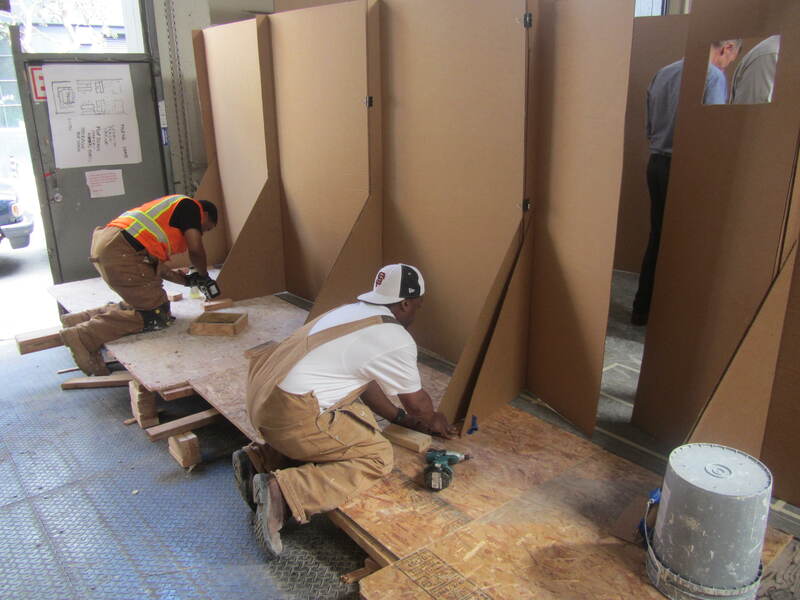 With the assistance of John Cothran ( our construction leader and instructor) and several former and current AND students we managed to build a floor and drill together the kit of parts needed to assemble the mock up in just a few hours. The agenda for the day was to talk about critical aspects of design for consideration, then break into groups and work with architects to design a section of the bus. Myself, John, and two of my amazing volunteers Jason and Abigail led those groups in order to help participants tap into their innate design knowledge. It apparently worked because when we all arrived in the workshop together I had never seen such enthusiasm and creative ideas coming to life so quickly. 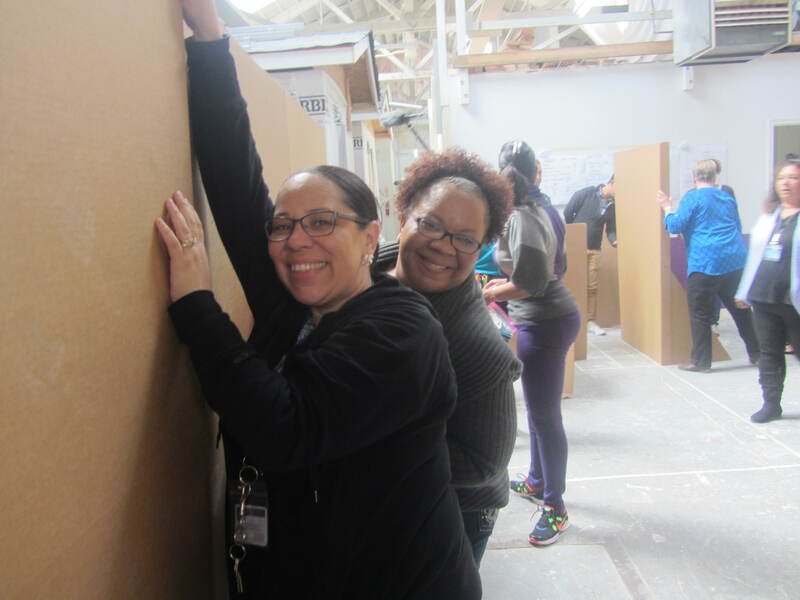 With utility knives, cardboard, fabric, papers, glue guns and drills a space for learning came together that included technology lounges, welcome areas and sections that popped out to provide even more space. They added supportive signage to the interior and exterior not forgetting to include plants, lighting, and furnishings. Frankly, I could not keep up with them nor had I provided all the necessary tools for them to manifest the scope of their ideas. Stairs for rooftop access and space to design exterior environments were ideas they had to describe even if they could not build it. 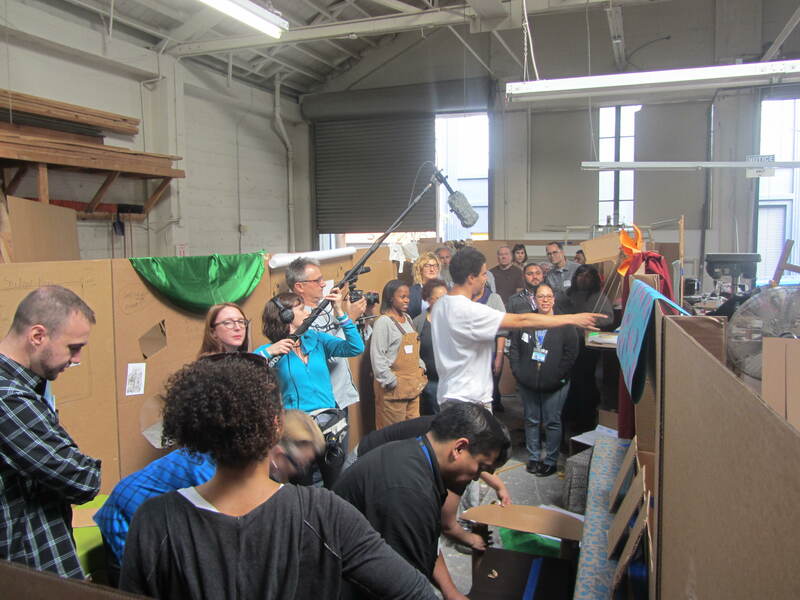 In addition to all that students and teachers we were fortunate to have filmmaker Richard O’Connell and his colleague there to record the experience for their documentary “The Corridor”. They were very stealth amidst the creative chaos although I am not sure how they managed. Honestly, I would never have thought of that. 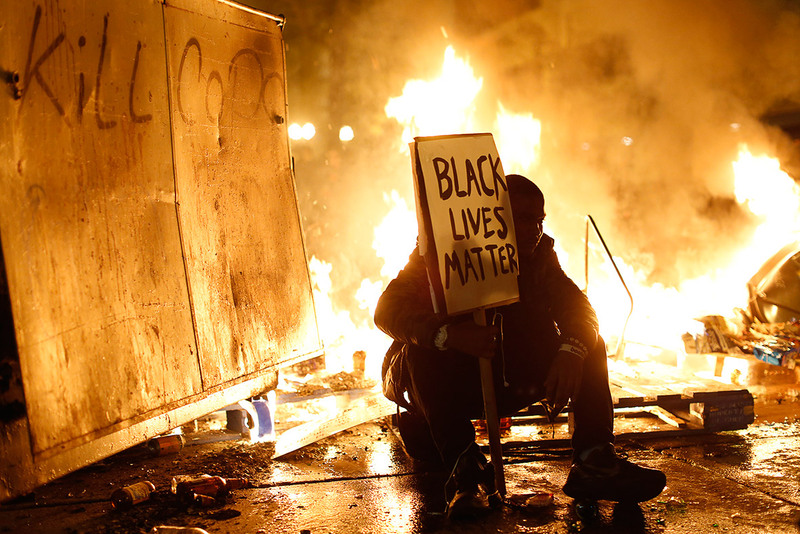 I continue to be in awe of the changes that are happening across the country as our consciousness is finally raised around the value of black and brown lives. It is helping me to do my work better as municipalities see the need to address the crisis caused by our prison industrial complex and are open to new innovative alternatives like the latest venture I have started and wanted to share with you. As some of you may know studies show that increased academic achievement is one of the most reliable predictors of reducing recidivism that occurs in our system at alarmingly high rates. 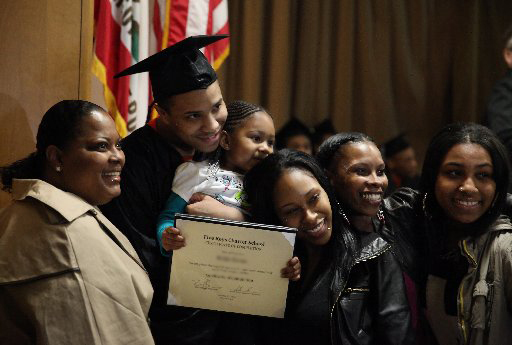 In order to address this issue my project partner the 5 Keys Charter School has opened more than 13 sites around the Bay Area and Los Angeles both inside and outside of jails to help thousands of students to get high school diplomas, GED’s, jobs, and life skills training. Check out this trailer of “The Corridor” , a film in the works that profiles their amazing program. Despite their success, the fixed location model necessitates hundreds of hours of student travel time to reach school locations. Time spent and the cost of travel present a marked burden for people who are living on a very low income. Additionally, many of the young adult students are single parents with limited options for childcare. Safety issues are another concern, as many students literally cannot cross certain streets to attend classes out of the real fear that they have entered into gang territory. Finally, students who begin courses at one location while incarcerated are often released to neighborhoods with no nearby classes. Therefore late last year I was approached by the founders, Sunny Schwartz and Steve Good, to help them adaptively re-use 3 municipal buses to be a school on wheels and mobile safe house for women and vulnerable inmates who are released during the night. At the time we had no funding but a good friend of mine, Prescott Reavis, told me about an amazing new fellowship called the Rauschenberg Artist as Activist and I also thought it was a very good fit. After several rounds of submissions and an interview I was awarded this fellowship that will fund us to not only develop these buses but to engage the community and build a robust infrastructure of mobile resources such as medical buses, fresh good trucks and catering offers to create what I am calling the Pop up Resource Village. Where would the bus go? These added wrap around resources will draw people to the site and support communities at the locus of need. Our work will also look at how this model can be an engine for urban renewal that will eventually make itself obsolete. The plan is not to just show up once a week but to collaborate with city agencies including the Department of Public Works to create a beautiful and functional environment for the resource center to plug-in and support the community even when the buses are not there. Our hope is that this strategy will turn blighted public places into welcoming spaces that encourage permanent development. 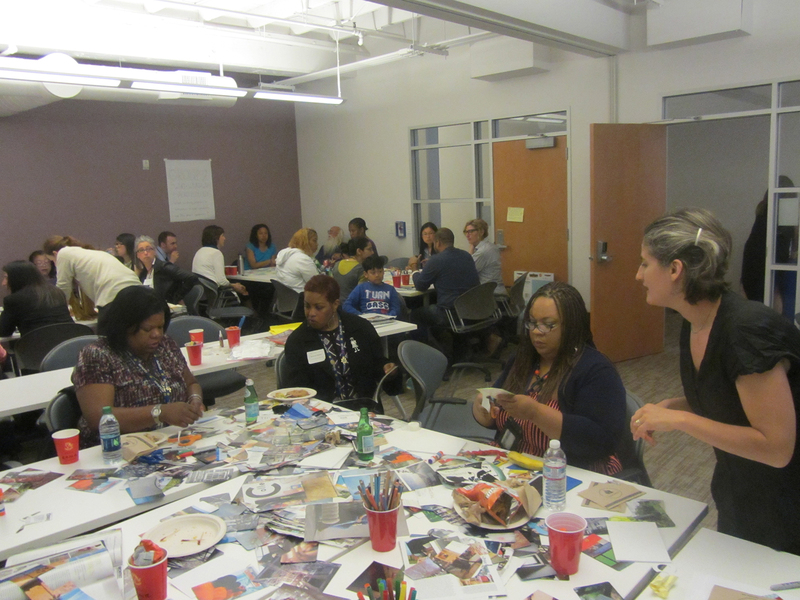 Just last week we kicked off the process starting with engaging funders, students, teacher and community leaders around how to develop this infrastructure. It was a huge success and a significant amount of knowledge was gained. As we begin design, we will work closely with our second project partner Asian Neighborhood Design who will work with their Employment Training Center composed primarily of 5 Keys students to construct the fit out. There are many new things happening as I start to move our work in a direction that scales these initiatives up to address city wide infrastructure. In the meantime we need these new prototypes and I hope you will follow the progress of this one with me over the next two years as we continue to explore the role that design can play in ending mass incarceration. Sadly, late last year the AIA indicated that they will take no action to address the participation of architects in designs intended to degrade, torture, or kill people. Raphael Sperry’s op-ed on CNN and a very powerful piece in the New York Times on this disappointing decision summarize AIA’s narrow and legalist arguments against human rights and present ADPSR’s forceful response. I was hopeful that in the wake of the changes we see happening in criminal justice policy that the AIA would be part of this shift. I also thought that the leaders of my professional organization would have the courage to make this much needed change in our code of ethics given that the Black Lives Matter movement has initiated the first honest dialogues on race we have had since the civil rights movement. Perhaps many in the AIA are ignorant( either willfully or because of the blinders of race, class, and gender privilege) of the fact that a disproportionate amount of those who are executed and who find themselves in solitary confinement are men of color. They should consider that the United Nations Special Rapporteur on torture has stated that long-term solitary confinement is a form of torture and a violation of human rights. 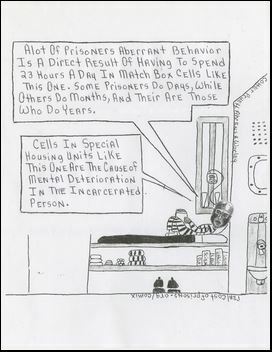 The United Nations has urged the United States to desist in its use of death and long-term solitary confinement as a form of punishment and control in our prisons. It is public knowledge that these practices are racist, dehumanizing and violate human rights so why would my profession condone our participation in the creation of these spaces as an ethical practice when so many other professionals including doctors, psychologists have not? 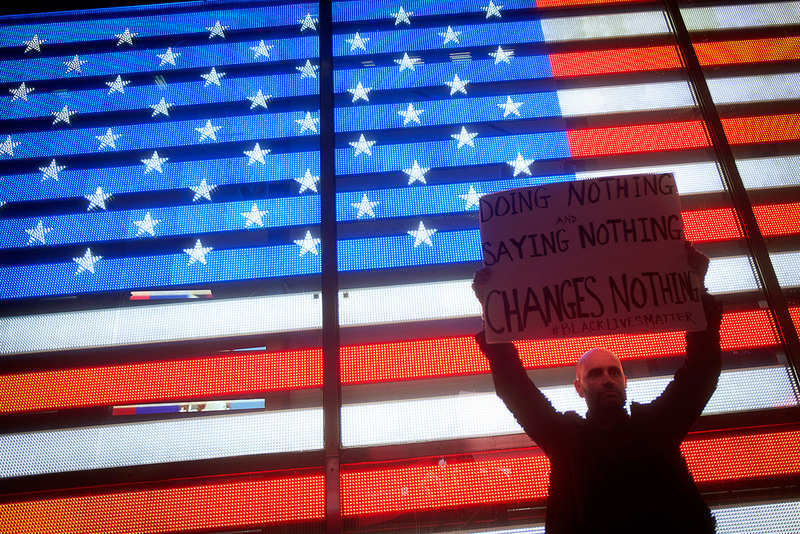 Why do we remain silent? Perhaps it is the shocking lack of minorities (including women) represented in the leadership positions of our profession or our tendency to be a bit self-absorbed. What I know is that the AIA has always been a conservative organization and sadly does not represent my values. I know that we have a long way to go in reducing the fear we have of the other and the discomfort that comes with changing our identity as well as the economics of business. That said, the arc of justice is also long and there are many leaders in our profession who believe this decision was made in error. The AIA may decide to adopt this amendment to our code of ethics in time. However, what is right and what is wrong here will still be the same. 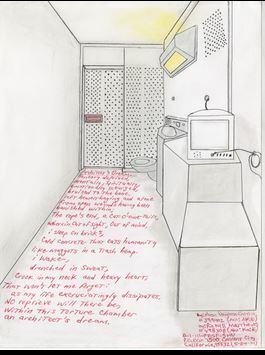 ADPSR continues to advocate for changing the AIA ‘s code of ethics to prohibit the design of spaces intended for torture or killing and if you would like to support this work please sign our petition or join ADPSR . We are stronger in great numbers! 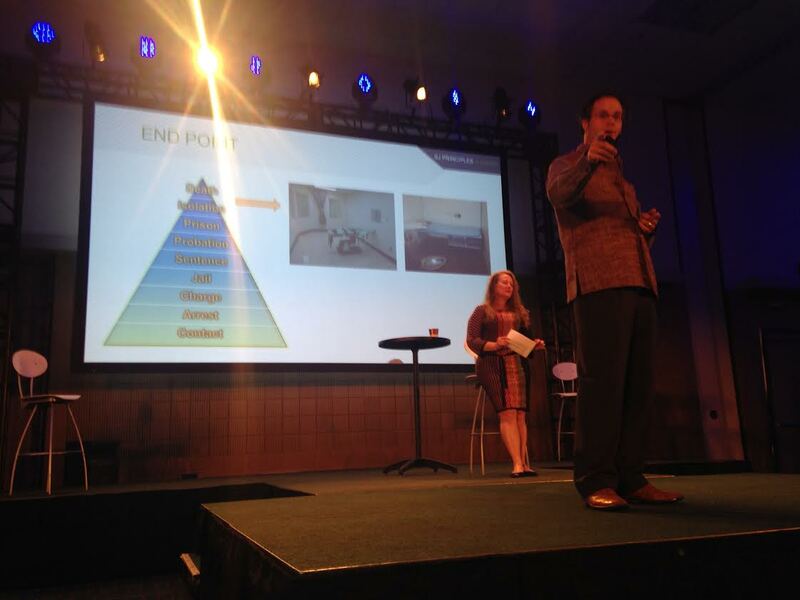 First article on restorative justice and design! I have been speaking with reporter Lee Romney for the last year or two about doing an article on Restorative Justice and Design. She had wanted to come into one of the jails or prisons with Barb and myself but we had been struggling to find a time and place where this was possible. 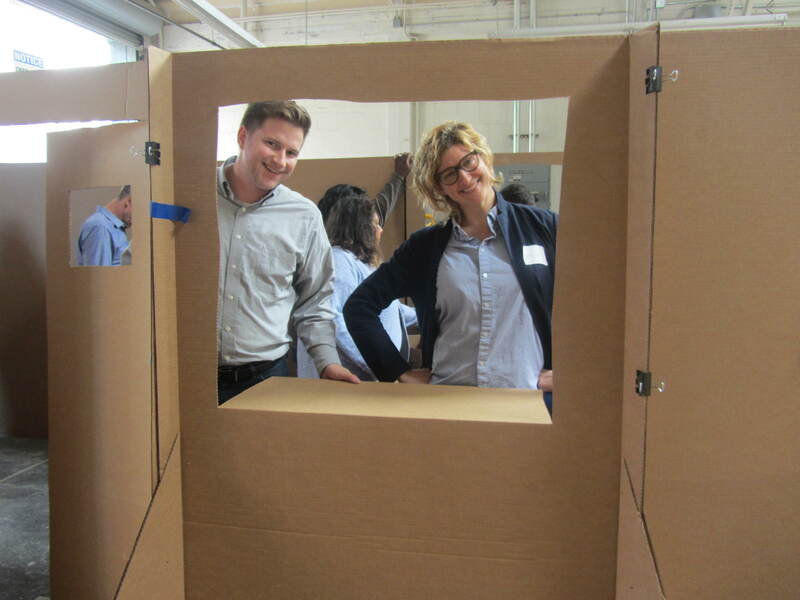 As seen in my last post Lee was able to take photos of our workshop at the San Bruno Jail and get the last piece of the puzzle for her article. While the title is a off to me the article itself tells a story about how we got here and where we might be able to go if we include everyone if our vision for creating a society that fosters healing and transformation. If you have some time today please take a look and let me know your thoughts. I hope this won’t be the last article on this topic! 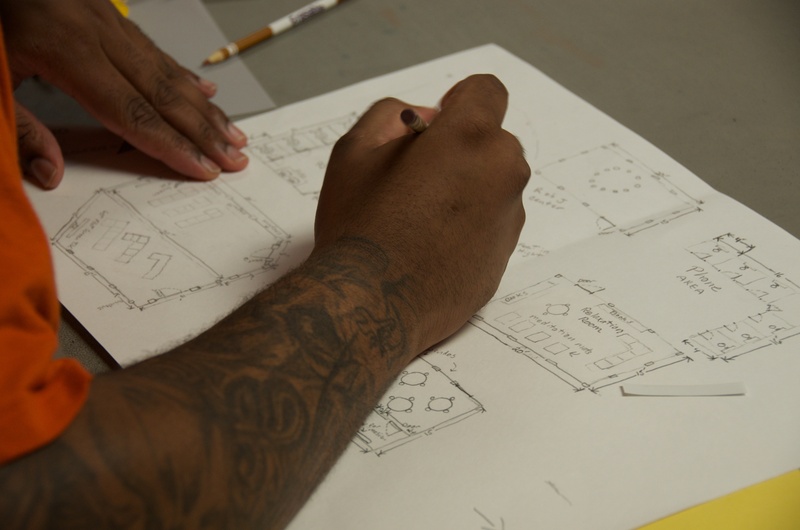 I know that some of you are following the designs studios my partner Barb Toews and I have been doing with everyone from peace builders to incarcerated men and women with our Designing Justice Designing Spaces Project. It has consumed my entire month of June so while you may not plan to use our DJDS toolkit I wanted to pass on the post I shared through our DJDS website with everyone. If you are planning to use it and aren’t on our list please let me know! Last week Barb flew back to Lancaster after our 3 week road show of testing the toolkit through a variety of courses and workshops. Our efforts took us from a university in Virginia to correctional institutions in Philadelphia and San Bruno, California. We are exhausted but happy! We successfully piloted a new class and 2 workshop formats. 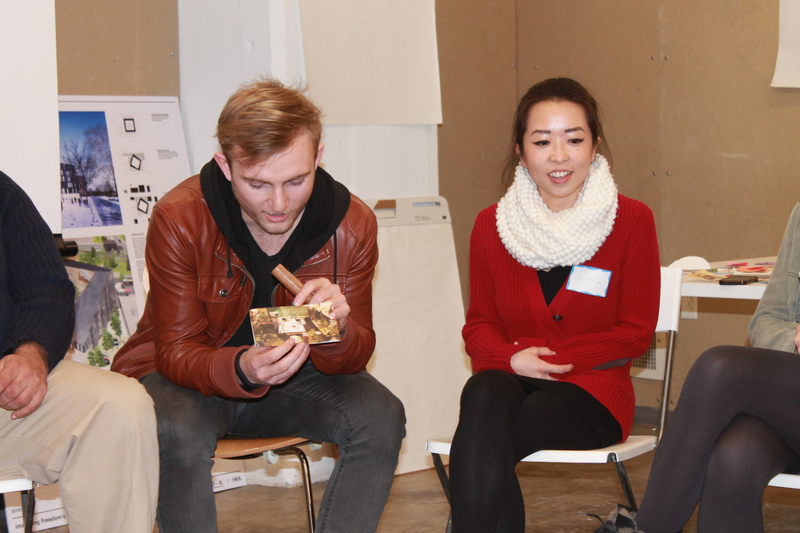 We learned a lot from both the participants and the different processes. During our first 10 days together, we taught Peace by Design at Eastern Mennonite University’s Summer Peace building Institute (SPI). 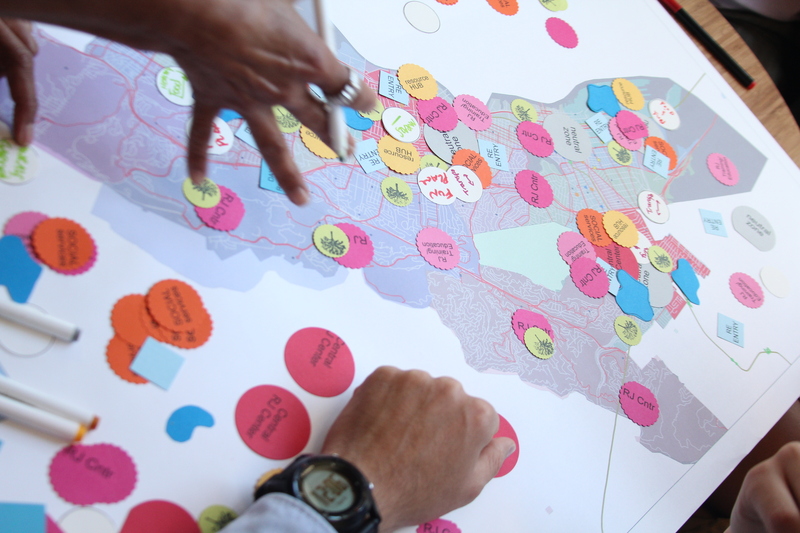 We had an engaged and diverse class of peace builders from the US, Canada, Iran, Liberia, and Afghanistan. 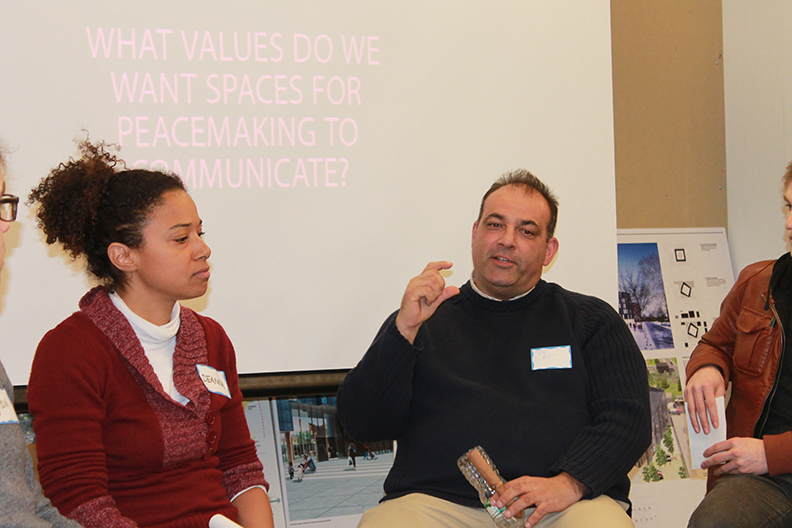 Together, we created a studio environment where we engaged in dialogue on the ways in which the design of spaces in which peace building and justice work happens is important to achieving its goals. We also taught design skills which students applied to the creation of design concepts for a new peace center proposed to house EMUs Center for Justice and Peacebuilding (CJP). 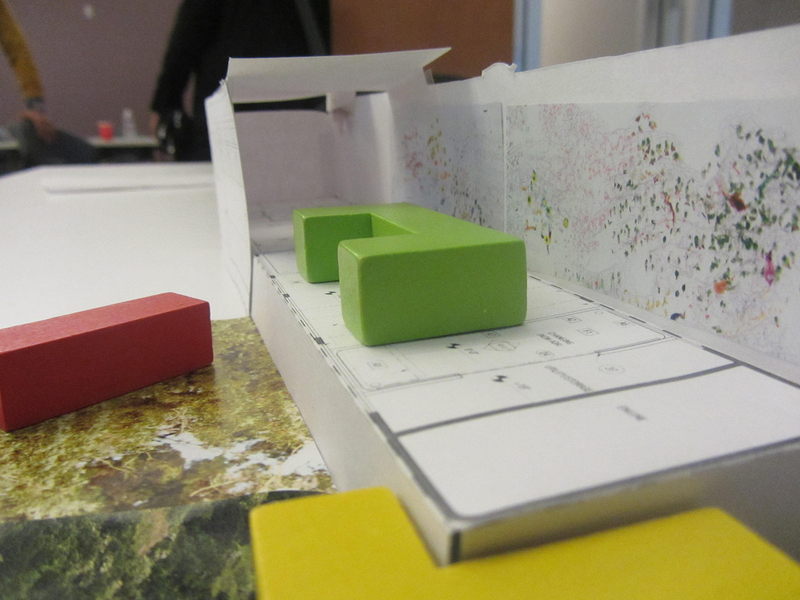 After a week of interviewing students, faculty, and staff, building models and much drawing, students presented three distinct design ideas to Daryl Byler, the director of CJP, EMU’s provost and an architect from a local firm with whom EMU works. Over the next month, the graduate students will be compiling all that was learned and created to produce a report for the architect and school. I love that the work from our class will be able to help the school move forward with their vision! 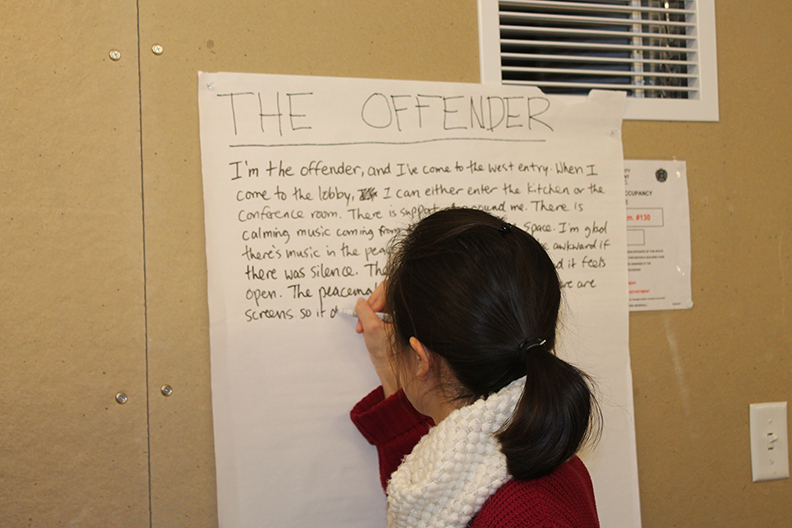 The second and third events over the last few weeks included workshops inside two county jails. After Barb and I rested for a weekend in our respective homes, we drove the two hours each way from Lancaster to The Cannery, a correctional facility for women in Philadelphia, for an intensive two day/10 hour workshop that we called Designing from the Inside Out. The Cannery was a far more chaotic environment than I had previously experienced as a wave of noise hit me walking through its 15 foot high barbed wire fences. In what was to prove to be a theme over the next two weeks, Barb, myself, and 9 students crammed into a tiny trailer, where we often had to improvise our class plan to help the students understand the philosophies of restorative justice and what a justice based in love might look like. For most of the ladies it could start with having some decent food in the jail. We tested a couple of new tools with furniture blocks and even created a new one on the spot. Such is the creative energy when space, time, and resources are limited. The nature of our work is production intensive. Papers, pens, pencils, customized rulers to reduce security risks, triangles and that need to be created for every group of students. We never know exactly how many we will have until the day a workshop starts. Barb and I have spent many nights and early mornings preparing these materials, which left little time for sleep and rest. This was greatly ameliorated, when we came back to the Bay Area, with the active involvement of our intern, Francis Goyes. 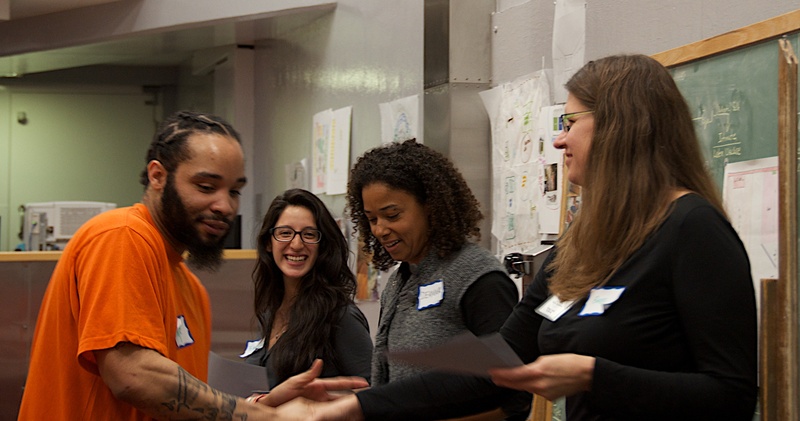 We were about to enter into a 5-day/10-hour intensive workshop at the San Bruno Jail in San Francisco County and her help, along with volunteer Kelly Gregory, proved to be invaluable as we now had 18 students with whom to work in a small room on the pod. The supply list was approved in time but on the day we learned that we could not bring in red and blue folders/pens that would signify any gang alliances among our group. Francis sat on the floor of the jail lobby folding paper to create new folders. We also started to reorganize our entire week plans as we found out Saturday was no longer an option for us to teach. Sitting in an opening circle with the 18 men, I knew we were going to have a great workshop. Coming from Community Work’s Resolve to Stop the Violence Program, these men were already well versed in restorative values and practices. This allowed us to engage more quickly with how it intersected with design. 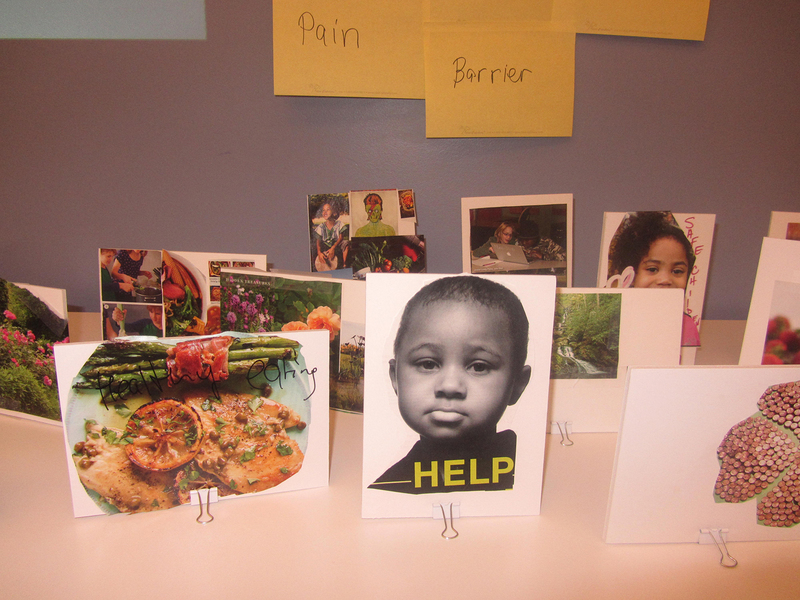 We created a group collage with images that represented current justice spaces and spaces for a justice based in love (a process created during the Cannery workshop). 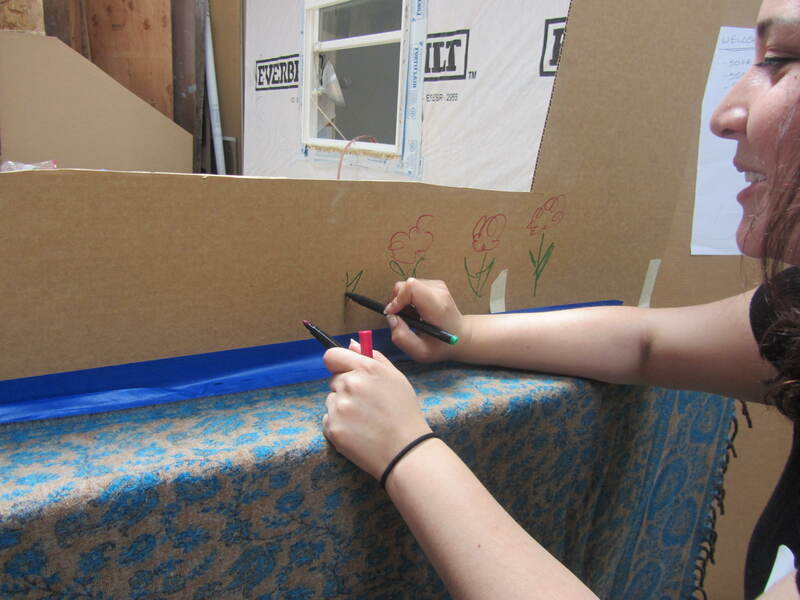 We also taught model-making, perspective drawing, collage, diagramming, and visual diaries. With time between classes, the men were also asked to interview staff, other men on the pod, or family members about how to create a restorative justice or healing center. They chose their own final projects and, after getting through the usual difficult process of choosing groups, they dug into their designs this past Monday, after a weekend break. 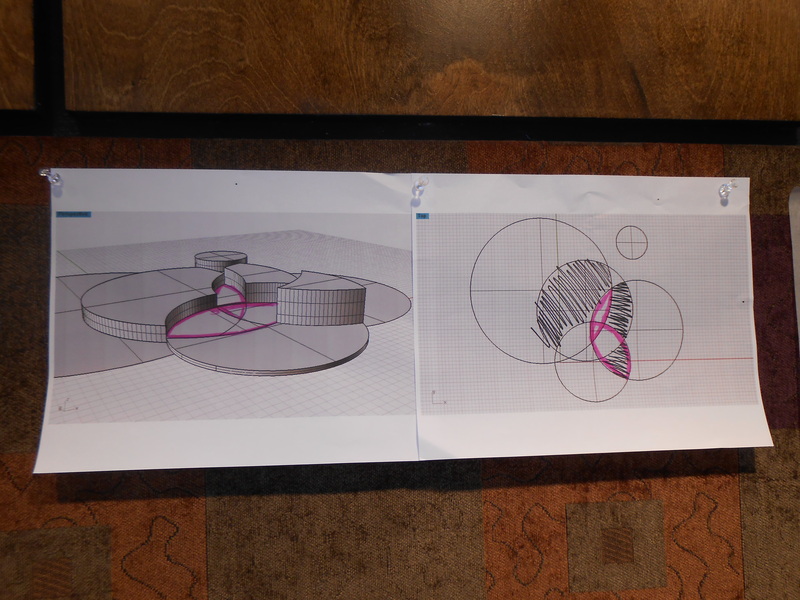 Their work represented some of the most sophisticated we have seen thus far and everyone did their homework! By Tuesday, we had developed two more tools that helped them to learn how to work in groups and prepare for a presentation. 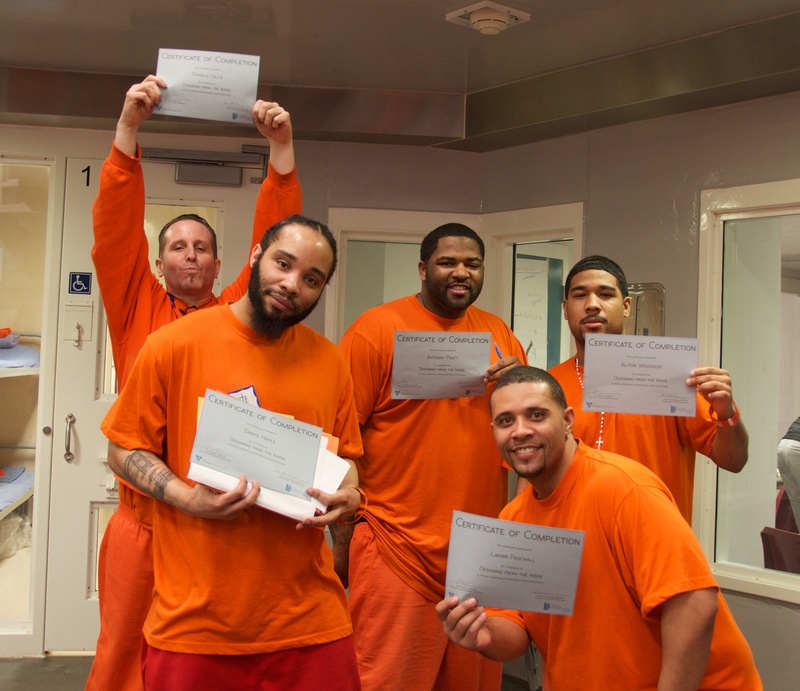 I could not have been prouder as the men presented their work, with pride, in front of RSVP staff, correctional staff, the entire pod, and journalist Lee Romney from the LA Times who took these great photos. It was an incredible end to an intense 3 weeks. Barb and I always have to take a little time to recoup but as our next set of deliverables to our amazing funder (Fetzer Institute) is due on Monday, we must keep going. Getting the first photos from one of our workshops yesterday is helping me do that and I hope that you will be inspired to join us. 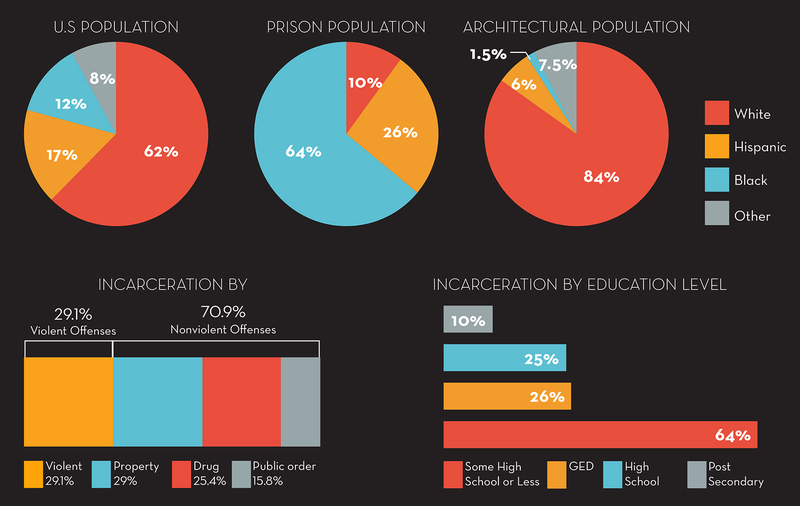 In response to the crisis caused by the prison industrial complex cities like Oakland are working towards the creation of a restorative justice city by developing new policies, education and training rooted in these philosophies and systems. 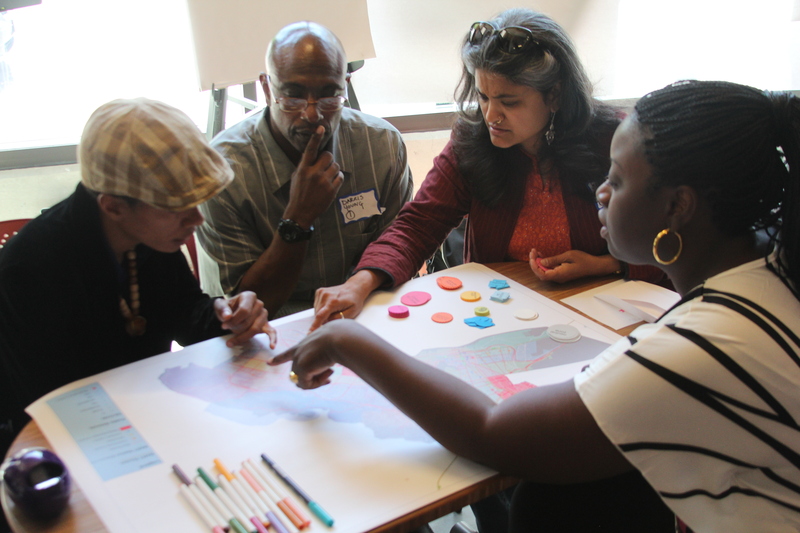 In support of these efforts On May 6th FOURM design studio joined, Bright Research Group and The Institute for the Future to facilitate a workshop on the creation of a physical infrastructure for the expansion of restorative justice in the City of Oakland. To the best of my knowledge it would be the first workshop where designers and researchers would team up with restorative justice practitioners, local government and criminal justice stakeholders to investigate the spaces, places and infrastructural programming needed to support the rise of restorative practices. Our day began with a peacemaking circle beautifully opened by Sujatha Baliga and Nuri Nusrat of the National Council on Crime and Delinquency. It was a chance for us to get a taste of what it feels like to be in circle and to open dialogue on the values of our current justice architecture. 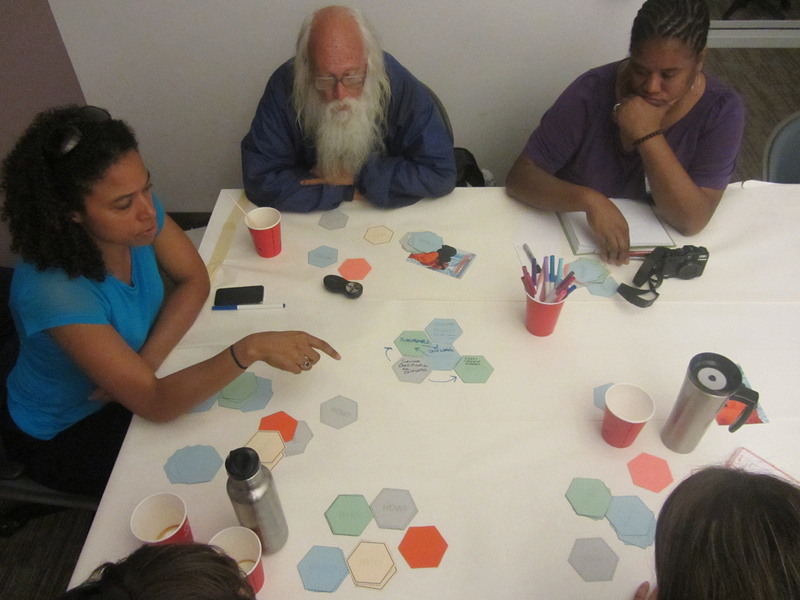 Our circle collectively shared words like grandeur, linearity, isolation, fear and power around our experiences of courthouses, jails, prisons and detention centers. In a second round those in the circle shared their story around an image they had chosen from a large pile we collected for the day. 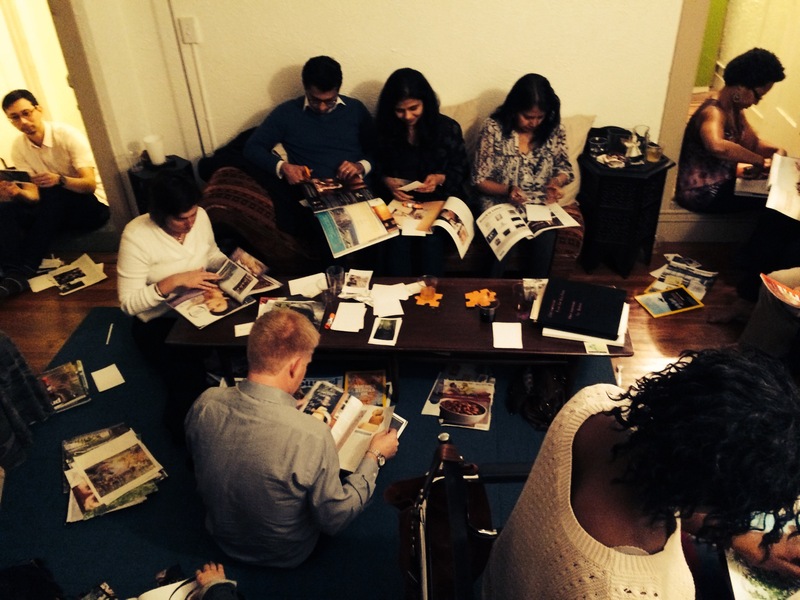 Using restorative justice philosophies and values as a starting point the leaders in the group held up images of nature, home spaces, breaking bread and freedom as qualities of spaces where we feel truly nourished and safe. How could these be applied to our Justice Spaces? Why do we need a restorative justice center or infrastructure and what community needs could it respond to? What is the current RJ infrastructure like in Oakland now? How does this facilitate or prevent your organization from achieving its goals? As we came together in a large group many leaders agreed that there was a need for an infrastructure that was micro localized where on site restorative practices could happen. Jason Walsh from Community works spoke about the need for a ”space” linked to practitioners in the community. I partnered with Lieutenant Armstrong of the Oakland Police Department who spoke about the need for an emotionally safe place in our communities where we could learn new behaviors around resolving conflict when it arises. He also identified our recreation centers as places where this could occur picking up on the theme of adapting and enhancing existing buildings for Restorative Justice practices than many leaders agreed on as one strategy for moving forward. 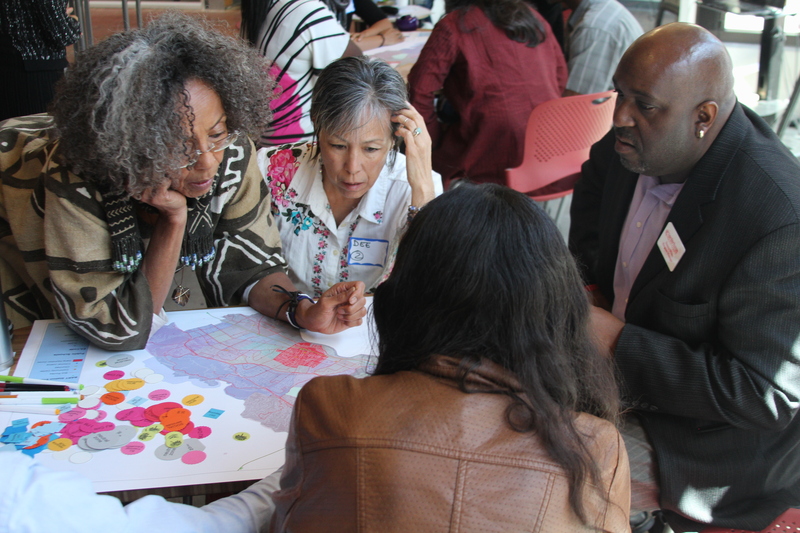 These needs and assets were then mapped over the City of Oakland with labeled game pieces and blanks for new ideas and suggestions where leaders were able to investigate the infrastructure they would need to address their goals. Where does it go? How do you get there? 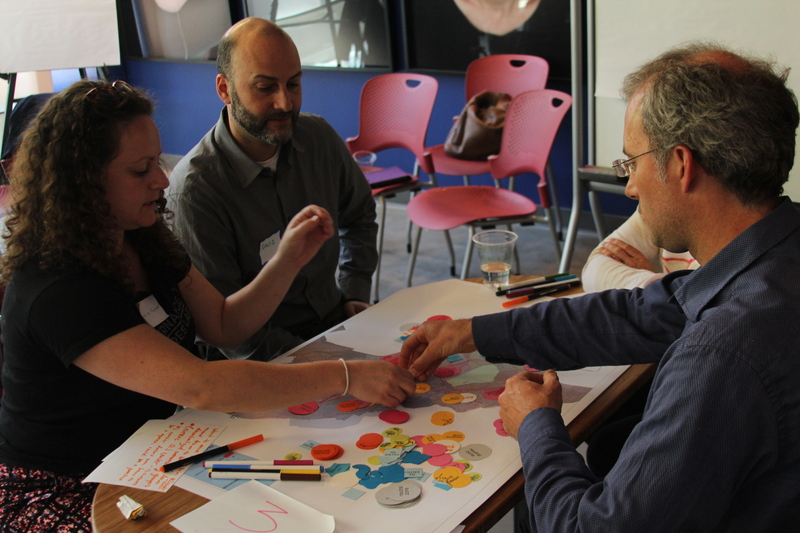 Our three groups generated a diverse and exciting range of ideas that included the incorporation of food justice to conscious social services that would be incorporated into mixed use restorative centers addressing a variety of needs. Retreat centers in the Oakland hills with associated transportation emerged from one group while another thoughtfully deliberated over the creation of neutral zones. Was it possible given our current context? Many explored the development of a Central RJ center . Some suggested it would be needed as a center for creating new policy and where the training of police, city officials and staff would occur. Others included re-entry, social services and day reporting into this module. 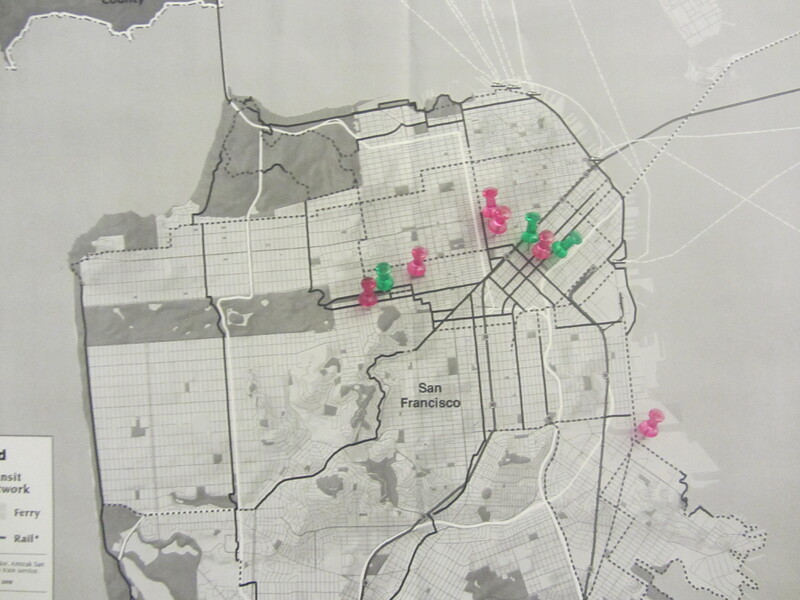 All groups looked at a distributed network of RJ centers mixed with criminal justice and social service components that targeted the keys areas of Fruitvale, East Oakland West Oakland, Downtown and some in North Oakland. As this new layer of restorative infrastructure started to emerge it was exciting to get a visual representation of how we could begin to support great change in our communities. I was humbled and grateful that these amazing change makers took their time to participate in first stages of creating this vision. I also know they believe in this new paradigm and understand that it will take all of us working together across an array of disciplines and sectors to make it a reality. 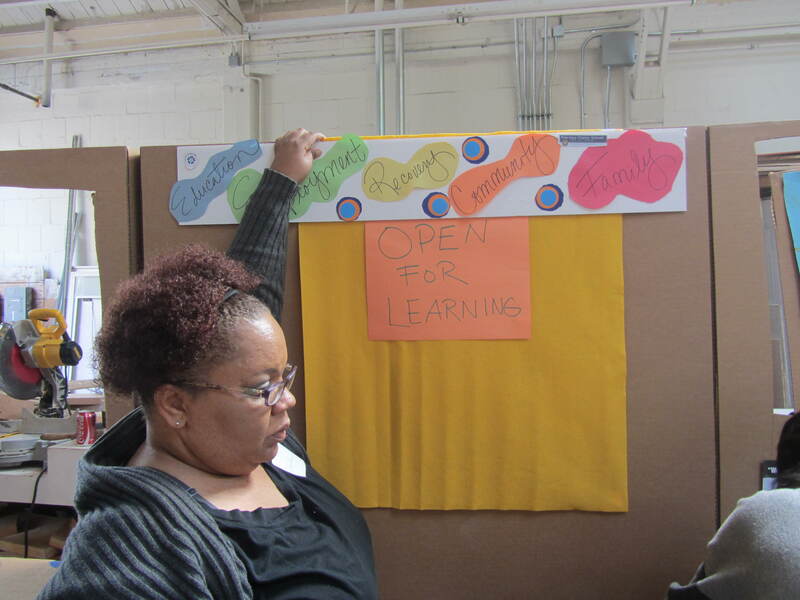 I believe there was great momentum and excitement among our leaders and for me the Creating a Restorative Future for Oakland workshop was truly one of the most rewarding professional moments I have had along this journey. I know that on the day I walk through a landscaped courtyard across a barrier free threshold to our first restorative justice center I will never forget it was born of the efforts we made that day. Last week I had a very successful visit to Syracuse New York where we began community engagement to create a peacemaking center in the Near West Side. Prior to leaving I invited some folks to my home to begin the conversation on creating these spaces by asking “What values does our current justice architecture communicate?” We had a lively conversation that teased out the qualities of these spaces and helped me more than ever to understand how the design of our courthouses actually elicits a diversity of feelings from excitement to guilt and fear. 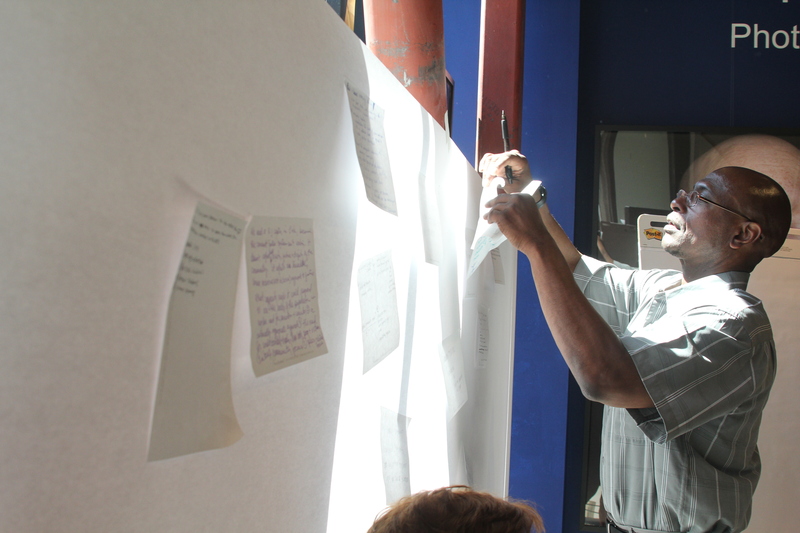 Afterwards we began to visualize what values spaces for peacemaking should have. I asked each person to generate 5 “playing cards” that would form an extensive and eclectic deck that I then brought to Syracuse to work with the community around these same themes. It was fun and surprisingly intense as folks cut images from magazine and one by one sat with me to explain why they chose them. I feel so grateful to have this amazing community that supports my work and I want to take this space to say thank you from the bottom of my heart. Moving on to another amazing community across the country, I spent my first day visited the Near West Side neighborhood in Syracuse again. While there I had the chance to meet the architects we are collaborating with, Ashley McGrath. 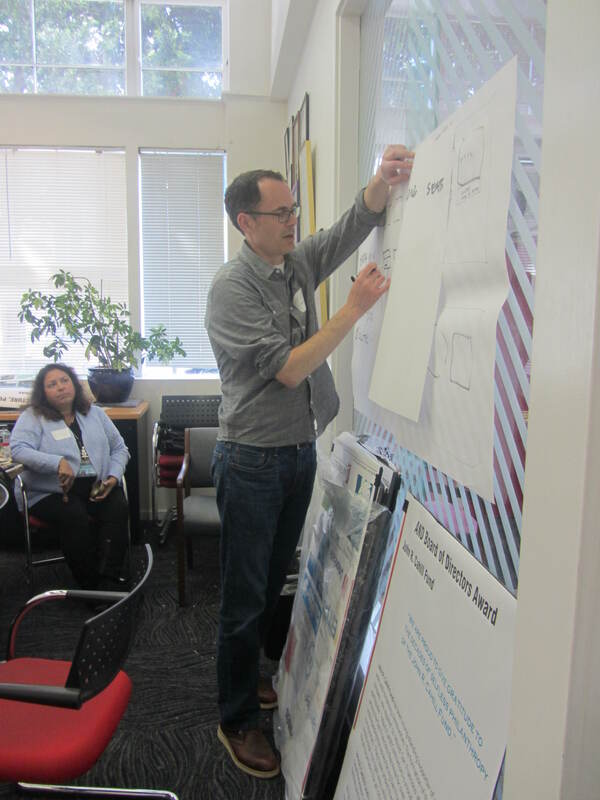 Their representative, Jason Evans, is a passionate advocate for his city which came out as he brainstormed to help us develop our process for the design engagement workshop. The following day Jason and my clients at the Center for Court Innovation spent an entire morning helping us create the materials we needed for the event in addition to those I brought from that gathering at my home. As I watched these practiced and erudite lawyers cut out little circles for peacemaking rooms and consultation spaces with complete focus and deliberation I asked myself what I had done to deserve these wonderful clients. That night with Jason and Marc Norman’s help I led the Center for Court Innovation, students from Syracuse University and community members such as Paul Nojaim( who owns Nojaims Supermarket the most amazing community grocery store I have ever seen) through a peacemaking circle. The circle helps those unfamiliar with peacemaking to understand the process. 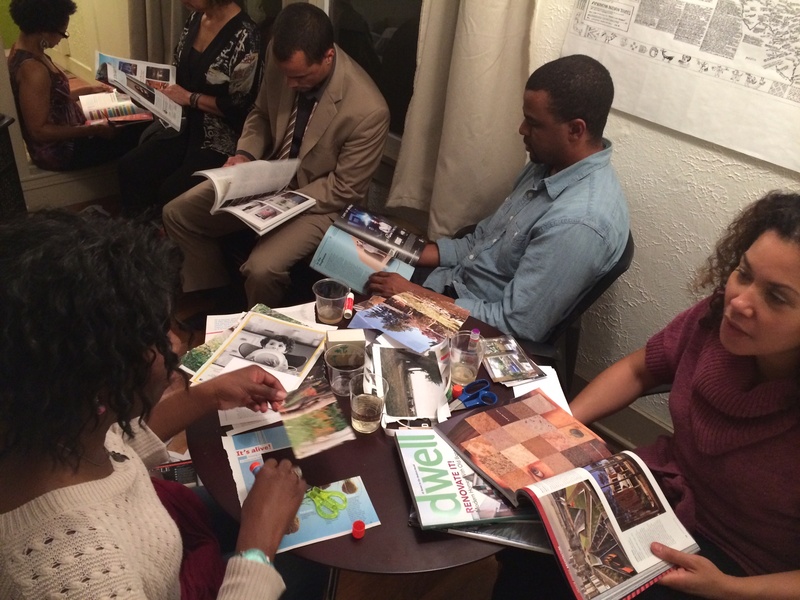 It also creates an opportunity for participants to express themselves with playing cards, objects and materials about spaces in their lives and community where they go to resource themselves. 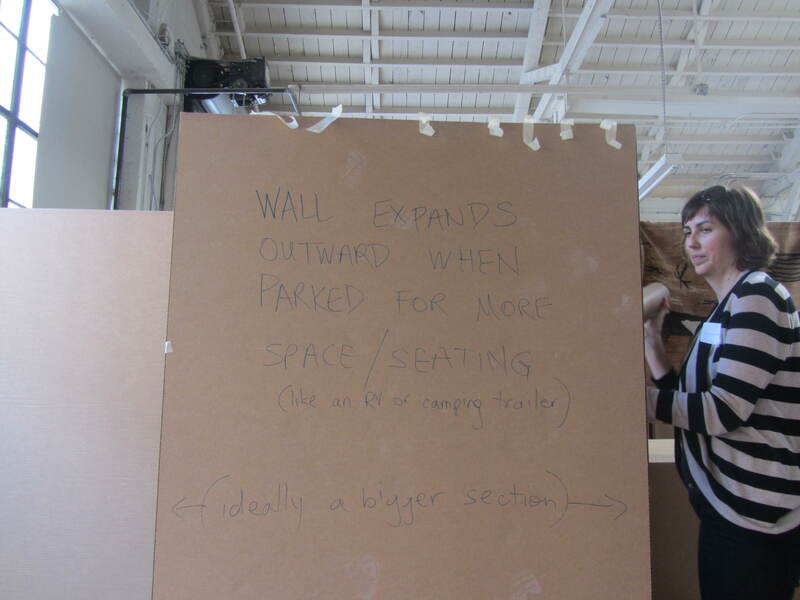 This phase then led everyone to participate in a diagraming and spatial visualization exercise. 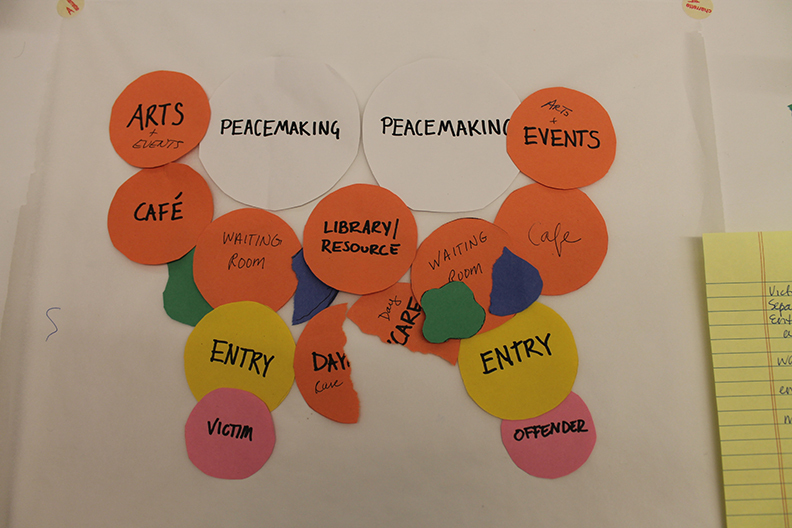 They broke into teams where they created a narrative and bubble diagram of the spatial sequences that a victim, offender or community member might experience when they entered a peacemaking center. As always I was amazed at the insights that come out. We debated about separate entrances and the stigmatization of this architectural feature the neglects to understand that offenders are often victims themselves. 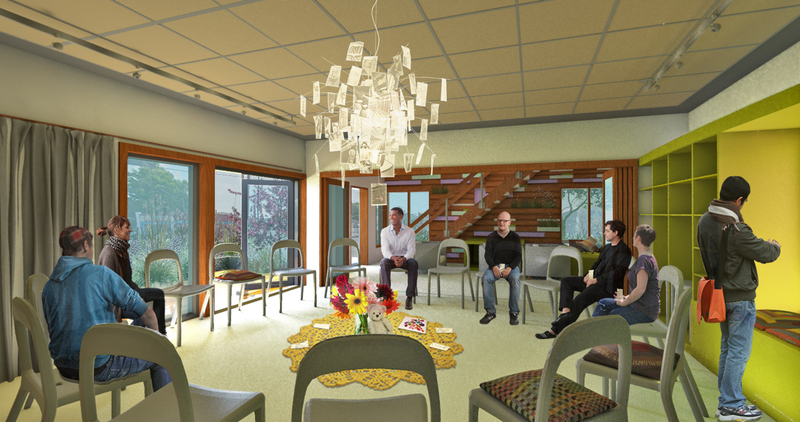 Participants came up with ideas for flexible spaces that doubled as libraries and break rooms for moments when decompression is required during the intense process of peacemaking. These ideas very much resonated with me as well as the creation of spaces for solitary reflection comprised of mirrors and views to the landscape. I cannot express how powerful and inspiring the collection of stories and thoughts from the community has been so far. I look forward to my next set of events in April and know that it will yield even more valuable content as we continue to create these new spaces across our cities. The Pop-up Resource Village makes the finals.